have a client who has “hooked nails” where they curve sharply downward in the shape of her fingers. I have a client who has “hooked nails” where they curve sharply downward in the shape of her fingers. If she has acrylics put on will it grow that way? Or grow straight? I’m not sure what she can wear for her nail condition. It sounds like you are describing pincer nails, where the nail has a transverse overcurvature and progressively pinches the nail bed toward the finger tip. Your client should see a dermatologist as there are a lot of causes of this condition — some hereditary and some acquired — and she would benefit from a medical evaluation. Acquired pincer nails can be caused by tumors or cysts as well as many other causes. She would benefit from keeping her nails short and cutting them straight across as opposed to on a curve in order to prevent them from embedding into the nail fold. Do our nails "peak" at age 20? 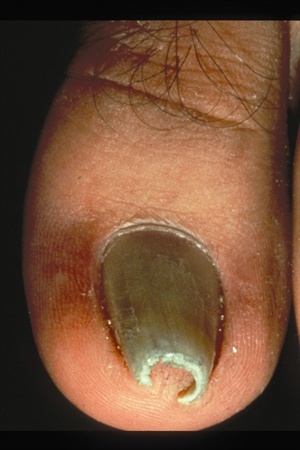 Can artificial nails make a nail fungus infection even worse than it already is?